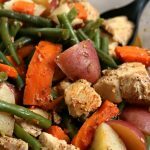 Well seasoned chicken, green beans, red potatoes and carrots are all cooked together in your slow cooker. A true one pot meal that is family friendly, tastes amazing and is so easy to put together. Prepare your chicken by cutting off excess fat and then cutting the chicken into bite size pieces. Add the chicken to the slow cooker. Prepare your vegetables. Wash your green beans and trim off the ends. Cut them in half. Wash your potatoes and cut the red potatoes in half (for firmer) or in quarters (for soft). Add all the vegetables to the slow cooker. Sprinkle in the salt, rosemary, garlic powder, onion powder, pepper, paprika and olive oil. Use a large spoon to toss everything together and to distribute the seasonings. Cover and cook on low for 4-6 hours. Remove lid, stir and scoop onto dishes and enjoy!